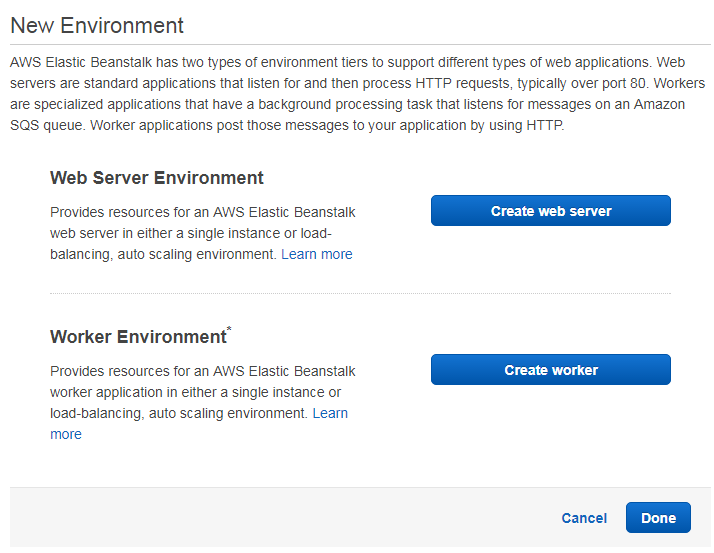 EDITORIAL NOTE: AWS Elastic Beanstalk is an orchestration service offered from Amazon Web Services for deploying infrastructure which orchestrates various AWS services, including EC2, S3, Simple Notification Service (SNS), CloudWatch, autoscaling, and Elastic Load Balancers. Elastic Beanstalk provides an additional layer of abstraction over the bare server and OS; users instead see a pre-built combination of OS and platform. 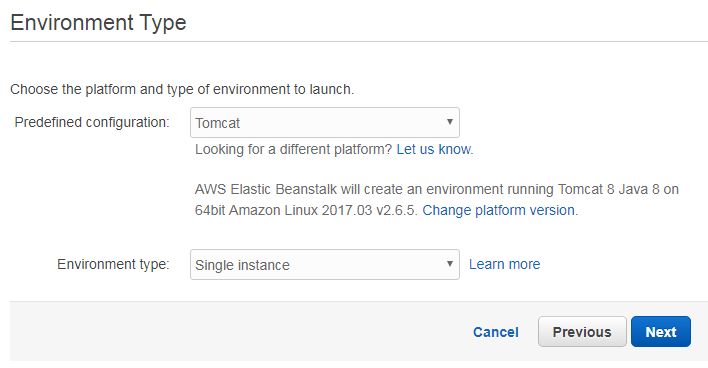 Now, we provide a comprehensive guide so that you can develop your own Amazon Elastic Beanstalk based applications. We cover a wide range of topics, from Deployment and Configuration to Java Integration and Command Line Interfacing. With this guide, you will be able to get your own projects up and running in minimum time. Enjoy! Amazon Elastic Beanstalk is a service that lets you use a set of existing Amazon AWS services to host your application. In contrast to more generic services like EC2, you do not have to provide an image of a machine that is deployed into a cloud, but you only provide a ready to run application that is hosted inside a predefined environment at Amazon AWS. 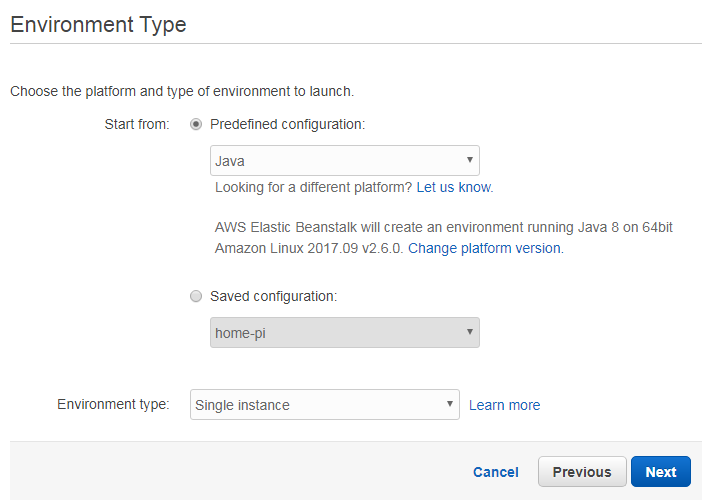 Amazon lets you choose between different predefined environments and sets up everything necessary to run the application on behalf of you. This service is therefore suitable for you if you want to concentrate on the application itself and not so much on the underlying operating system and server. However, as Elastic Beanstalk uses under the hood existing services like EC2, S3, CodeCommit or Route 53, you have full control over you application. Amazon Elastic Beanstalk defines a set of terms that are used throughout the service and therefore must be understood from the beginning on. An Application is a set of components that not only encompasses different versions of your application but also configurations for environments the application is deployed to. 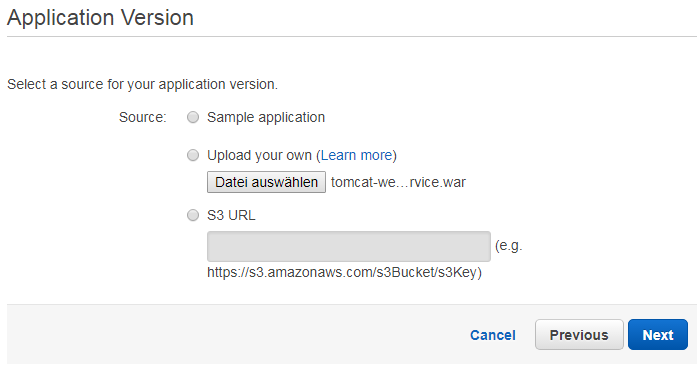 An application version is a deployable artifact that is labeled and stored inside an Amazon S3 bucket. It can therefore be restored at a later point in time. An environment is a set of Amazon AWS resources that is used to run a specific version of the application. Different environments can be configured and a version of the application can run in different environments. Different environments can exist at the same time and can also serve different versions of the same application. An environment consists of two tiers: the web server environment and the worker environment. While the web server environment serves HTTP requests the worker environment reads messages from a queue and processes them. This way applications can use the “worker queue” pattern to decouple business logic from serving HTTP request. An environment configuration encompasses the settings of an environment. Applying this configuration will let Amazon AWS create the corresponding resources. Existing templates can be used to create configurations and are therefore called Configuration Templates. A “Web Server Environment” provides all resources to run your application. It consists of one ore more web servers on which your application is deployed. These web servers are hosted on EC2 machines running inside Amazon’s AWS cloud. As these machines sit behind a Elastic Load Balancer, they can be reached by a CNAME name like myapp.us-west-2.elasticbeanstalk.com. This CNAME is aliased to an internal load balancing URL using the Route 53 service. This Amazon service provides high availabilty through the usage of the Domain Name System (DNS). 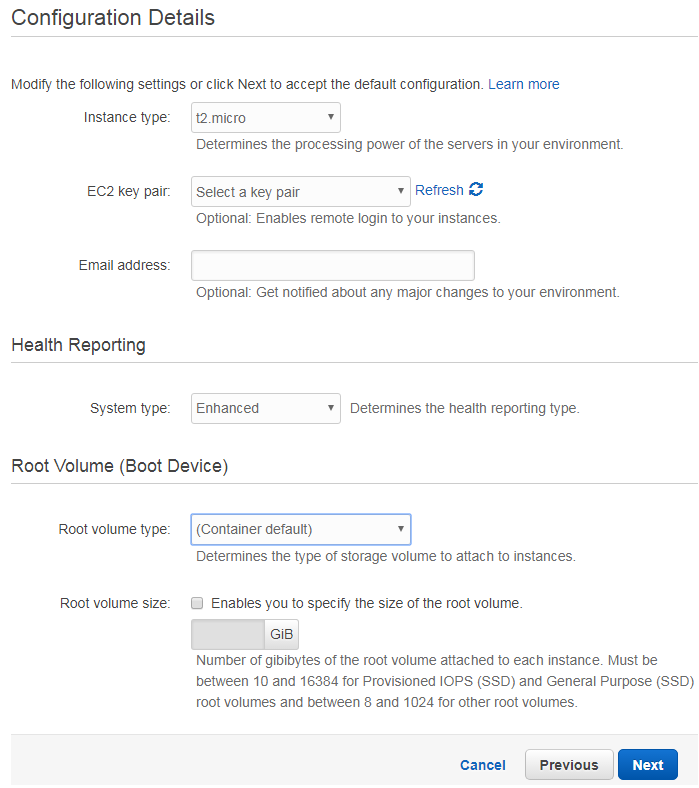 The EC2 machines of your environment can be part of an “Auto Scaling” group. This means that Amazon automatically increases the number of instances if the load increases and on the other hand decreases the number of machines down to at least one machine if the load vanishes. The “Host Manager” running on each machine has the task to deploy your application and to collect metrics and events. It also monitors the application server and rotate log files if necessary. In case one component of the environment needs a patch or update, the “Host Manager” can perform this update on behalf of you. “Security Groups” define firewall rules for a set of instances. The basic security group in the web server environment allows access to port 80 (HTTP) of your application. If you need to use a database, you are free to define further security groups with more fine-grained control. A “Worker Environment” provides all resources to run worker applications that consume message from an Amazon SQS queue. It therefore not only provisions EC2 machines that run your worker application but also a SQS queue that can be used to transfer messages from the “Web Server Environment” to the “Worker Environment” and back. A daemon running on each instance of the “Worker Environment” pulls requests from the queue and delivers them to your application. Before starting an application, one has to carefully think about the design of it. One aspect that is of significant importance is scalability. Basically there are two different ways to handle increasing load on an application. The first way is to increase the available hardware resources for each machine such that it can handle more load. While this way can be used to scope with small increases of load it does not scale to arbitrary demands. The second way is to increase the number of running services (horizontal scaling), as it allows to add more machines if necessary. 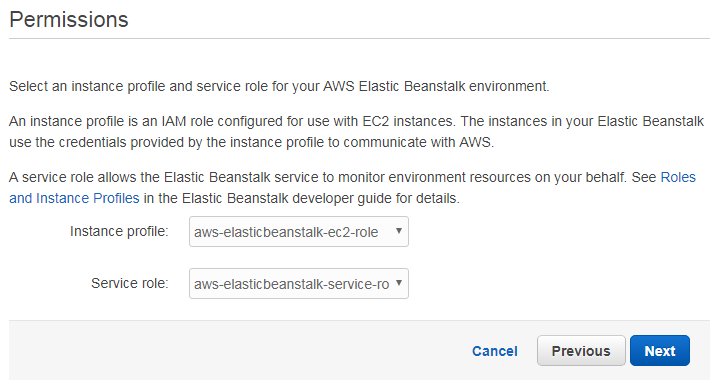 This second way is the one followed by Amazon Elastic Beanstalk, as a tight monitoring of the available EC2 instances allows to setup new instances in an auto scaling group if necessary. But it also means that the application is designed and written to be able to scale out. Instead of building a monolithic application that needs more and more hardware, horizontal scaling means to distribute the load over an arbitrary amount of smaller services that are as stateless as possible such that new services can be added at runtime if necessary. The load balancer in front of the web server environment will distribute the incoming requests among the available services, requiring that each service can process one of them. Another important point when developing an application for AWS Elastic Beanstalk is security. The data transferred into and out of the web server environment can be encrypted using SSL. One must therefore acquire a valid certificate from one of the external certification authorities (like for example VeriSign or Entrust). Note that the SSL encryption ends at the load balancer of the environment and that traffic between it and the web servers is normally not encrypted. 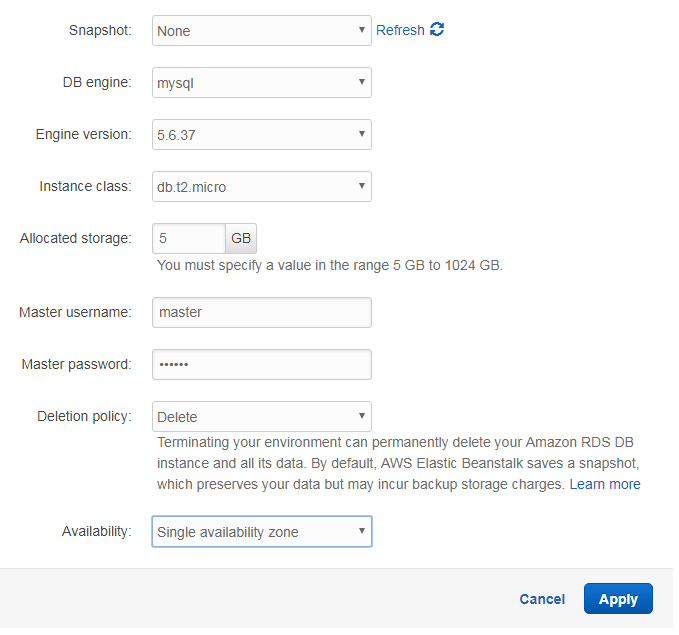 Amazon S3: This service can be used to store arbitrary amounts of data in the cloud. Amazon Elastic File System: The EFS can be mounted on your EC2 instance and used like a normal file system. Amazon Elastic Block Store: EBS volumes are attached to EC2 instances and can be used to in conjunction with file systems or databases. Amazon DynamoDB: This service provides a NoSQL database within the Amazon cloud. Amazon Relational Database Service: RDS manages six different relational database engines (Amazon Aurora, PostgreSQL, MySQL, MariaDB, Oracle and Microsoft SQL Server) that can be used by your application. In case users around the world experience different latency times, you can use Amazon CloudFront to let it automatically distribute your application and storage around the world and route the user to the nearest available site. Last but not least you can let Amazon update and patch your environment, in case this becomes necessary. These updates are performed as “rolling batches”, i.e. Amazon takes the first batch of EC2 instances and terminates them. After the new instances have come up, the next batch can be processed. The condition whether the next batch should be processed or not can be based either on a timing policy or on the health of the new machines. This procedure allows to keep the site running, while old and new services of your application are running for a short period of time. To make this work, you must of course design your application such that the old versioned services can read the data already written by the new version, for example. Now that we have learned a lot about the concepts behind Amazon Elastic Beanstalk, we should get our hands dirty and develop a small application that exposes a simple REST interface using Apache Tomcat. With the XML element display-name we define how the application is labeled inside the Apache Tomcat server. The servlet and servlet-mapping elements define the Servlet class that is listening for requests and the URL pattern it should listen for. In our case we using the pattern /tutorial-service/*, i.e. all URLs that look like http://://tutorial-service/* will be processed by this servlet. Next to the mere API contract (javax.ws.rs-api), we are defining to use jersey-container-servlet as JAX-B implementation and jersey-hk2 for dependency injection for jersey. As the Amazon SDK is using commons-logging we are doing the same. As logging service we have chosen the classic log4j implementation. The junit and jersey-client dependencies are currently only used for our integration tests. The maven-compiler-plugin is used to define source and target version of the build. This is necessary because the provisioned services have a certain Java version installed and we must therefore compile an artifact that can be executed in the target environment. The surefire and failsafe plugin are used to executed the local junit and integration tests. Finally, the tomcat7-maven-plugin allows us to start and stop an embedded Apache Tomcat server in the build in order to execute the integration tests. The class is annotated with @Path to tell the JAX-RS framework that all relative URL paths used in the class itself should be prefixed with /tutorial. For the sake of simplicity we have currently only one method: listAllCourses(). Its part of the URL is denoted with another @Path annotation at method level. That an invocation of this REST resource will return a JSON string is specified with the annotation @Produces and the media type text/json. We need to have a default constructor such that the JSON library can deserialize objects of type Tutorial from a string representation. The getter and setter methods allow the JSON library to set the corresponding attribute values. In this example we also implement the methods equals() and hashCode() as we want to compare instances of Tutorial later on in our integration tests. As mentioned before, building and deploying the application now already to AWS is an option, but it will take some time until the deployment becomes available. The first line of the method testListAllCourses() creates a new REST client while the second line provides host, port and the path on the server. For our local tests localhost is appropriate. Tomcat runs per default on port 8080. The URL consists as first part of the name of our war file that is deployed to Tomcat. We have defined this in the pom.xml file using the XML element finalName. We can see that the tomcat server is started before and after the integration tests. At the end of the build the file tomcat-web-service.war resides inside the target directory of the our project. This is the application that we are going to upload to Amazon Elastic Beanstalk now. If you haven’t created an Amazon AWS account yet, you should do so now by pointing your browser the following URL and clicking on the link labeled “Create an AWS account”. During the following steps you will have to provide the typical personal information plus a valid credit card. The latter is necessary to allow Amazon to bill the resources you have used. When you create a new account, you are eligible for the “Free Tier”. The next page asks us whether we are going to setup a web server environment or a worker environment. Our sample REST application fits best in the first type of environment; hence, we click on “Create web server”. For a web server environment, we must set the configuration and the type. We choose “Tomcat” as predefined configuration and “Single instance” as type. 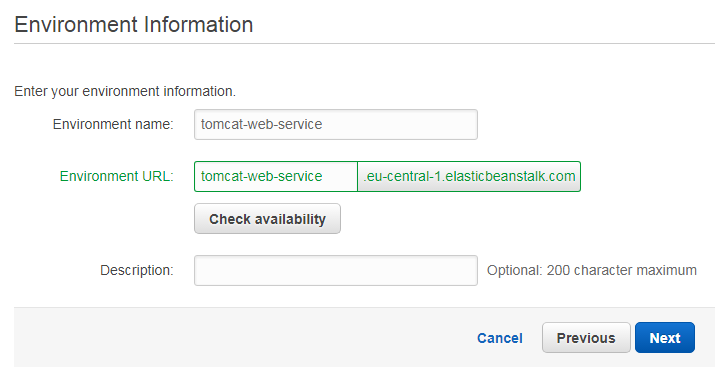 This way Amazon provides us an EC2 instance with installed Apache Tomcat server. We do not choose auto scaling at this point, because for our sample one instance is enough. The following page requests to specify the application version. We select therefore the second option and choose the war file our maven build has produced before. Alternatively, we could also provide a link to an artifact we have uploaded before to Amazon S3 or chose one of Amazon’s sample applications. In the “Configuration Details” sections we can choose a server type. A t2.micro instance is sufficient for our experiments, but if you prefer you can choose a larger instance. The EC2 documentation describes the available instance types in more detail. The remaining input fields can be left as they are, as we do not have any specific requirements for the disc of the instances or the health reporting. A EC2 key pair is also not necessary. Environment tags can be used to identify environments in cost allocation reports or can be used to in general to manage environments and permissions. For our first sample application, tags are not necessary but you are free to provide them. The “Permissions” page allows to define an instance profile and a service role. The instance profile is the IAM role that is used by your application to communicate with other AWS services while the service role is to monitor the environment. As expected the browser displays a JSON array with three Tutorial items. Application eb has been created. As in the web console, we have to select a preconfigured platform for our application. We choose here Tomcat and not Java(! ), otherwise our application would have to open its own port and serve requests. Up to now, our sample application does not store any data. As pointed out before, we will lose all state on the local machine once the current machine is shutdown because the auto scaling mechanism no longer needs it. Hence, we must store the state of an application in an external datastore. One option that often comes handy is Amazon’s NoSQL database “DynamoDB”. In DynamoDB data is stored in tables, like in relational databases. A table is a collection of items, each item consists of one or more attributes. An attribute is a key/value pair. In contrast to relational databases there is no schema, i.e. each item can have different attributes. As an example, you can create a table to store events. Each event is an item, and the data describing a particular event is stored using attributes like its creation time, type of event, etc. Each item has a hash key and optional an additional sort key. The hash key is used to distribute the items in large tables over different partitions. If a table has a sort key, it is used to store the items with the same hash key in a sorted manner. First, we obtain a reference to the AmazonDynamoDB client. Its method query() takes an instance of QueryRequest to perform a query on the requested table. In this simple example, we want to search for all tutorial that are provided by a given author. The author is passed as query parameter to the URL. In JAX-RS this means that we specify an argument for the method listAllCourses() that is annotated with @QueryParam("author"). The value passed to the annotation denotes the name of the query parameter in the URL that should be passed as String into the method. The condition for the query is written as follows: author = :a. The string :a is an attribute, for which we must provide a value. This is done by constructing a HashMap and putting a value for the key :a into it. This HashMap is then set on the QueryRequest. Please replace in the URLs above the string <your-app> and the region with the CNAME and region of your application. Removing all tables is of course not necessary, but it does not harm in this case as we only delete tables that exist. Now it is up to you to implement a method that inserts data into the table. On this page we have to specify the basic configuration details for the RDS instance. As we do not have an existing snapshot, we chose “None” in the corresponding field. As DB engine we chose “MySQL” in version 5.6.37. This DB is supposed to run on a “micro” instance with 5 GB storage. The “deletion policy” determines what should happen if we remove the instance. As this is a tutorial, we do not care about the data and let Amazon delete the instance and all of its data. It will provide a URL that ends with /rds/list-all-tables and returns a list of all available MySQL tables. The method listAllTables() therefore calls the private method listAllTablesIntern and returns a HTTP response with status code 200 if no exception occurred or a status code 500 if listing the tables failed. The code above uses the already explained method createConnection() and can therefore be understood easily. The two SQL statements to create and drop the tables are issued over the JDBC API using its executeUpdate() method. We close each statement and connection after its usage to free resources. Please note that in a real world application you might want to pool the connections in order to reuse an existing one for the next request. Modifying the code that inserts and queries tutorials is up to the reader. The previous chapter explained how to use the Apache Tomcat environment to run a simple REST API server. The same can be achieved through the popular Spring Boot framework. In this chapter we are therefore going to build a Spring Boot application that runs inside a “Java” environment on AWS and not within a “Tomcat” environment. The main() method starts the Example class as controller and passes the optional arguments from the command line to the run() method of the SpringApplication. Annotating the class with @RestController turns it into a REST endpoint. The method home() just returns a static string. Its annotation @RequestMapping("/") denotes that it should be called in case the user requests the root URL of our application. It is a simple junit test that runs with a SpringRunner. The annotation SpringBootTest tells the framework which resource we want to test and the port to use. The actual code of our test is simple and uses a jersey client to invoke the URL http://localhost:5000/. Please replace spring-boot-web-env and eu-central-1 with the CNAME and region of your environment. Now you should see the string “Hello World” in your browser. Note that we use the standard port 80 to invoke the REST API and not the port 5000, as the proxy in front of our application listens on the standard port and only dispatches this to port 5000 of our application. This was an Amazon Elastic Beanstalk Tutorial.